The beauty of travel is that sometimes amazing things just happen out of the blue. While I was in Porto, Portugal I was out wandering the streets around dusk hoping to get a photo or two. When I was done, I stopped in at a café for some dinner. Soon, the café began to fill with people with video cameras and DSLRs. I asked what was going on to which they replied: “go have a look outside”. Outside the café a part had erupted. 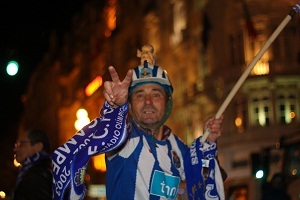 That night, thanks to the loss of a rival club, FC Porto won the Portuguese League championship. Like a good journalist, I pulled my camera out of my bag and began shooting the scene both in photos and in video. It was hard not to get caught up in the emotion and celebration as I often found myself signing along to the team chants of a club I hardly knew existed. Below is a video, also containing some photos, of what I managed to capture that evening in Porto.